Congratulations for doing the work to stay away from alcohol and any non-medically necessary substances for this #14Days on the Wagon challenge. Together, we have built a movement toward enhanced health, a more comprehensive understanding of addiction, and some of the diverse options available in treatment. If you started this journey with us on October 6, you are one day away from reaching the goal of #14Days. Here's a look at how you're doing "on the wagon." In our very first video, Tommy Rosen, founder of Recovery 2.0 suggested getting a buddy to take the challenge with you. Many of you took his advice and reached out to friends for support. #14days. Having a friend doing the challenge helps. The challenge was harder than some people anticipated. Made it through the weekend on the #14days challenge. Will say the Cardinals rocky playoff run is making it harder. The #14days challenge is surprisingly tough. How am I supposed to get through family functions now?! But you managed to find some of the positive effects of not drinking. Many of you were inspired to write your own blog posts and articles about your involvement. Kelly Burch, the editor of Renew Magazine, discussed the effects of committing to two weeks of sobriety on the #14Days challenge. Burch wrote, "I realized that often times I am drinking without really thinking about it. In our society, so many situations are set up to seem incomplete without drinks in hand. I'm sure that alcoholics and people in recovery are acutely aware of just how common this is, but I wasn't." Some people in the recovery community supported the movement. On her website, afterpartychat.com, comedian Danielle Stewart shared that, although it's helpful to have this conversation around addiction, if you don't struggle with a drinking or drug problem yourself, there is no way you could feel what it's like for an addict to stop using. Stewart shares her ambivalence about the campaign: "And that's the real issue with #14Days; it's simply not enough time to prove anything to anyone. At the height of my drinking I am sure I could have gone two weeks without a drink if the purpose was to show people I didn't have a problem. I was willing to go to any length to protect my drinking and my ego." When we spoke with Dr. Drew, he agreed that while giving up alcohol and standing in solidarity with those in recovery is positive, if you don't struggle with the disease of addiction, you will never know what it feels like for an addict to quit using. We are grateful you joined us in spreading the word. If you missed starting with us, it's not too late for you to begin on your own. 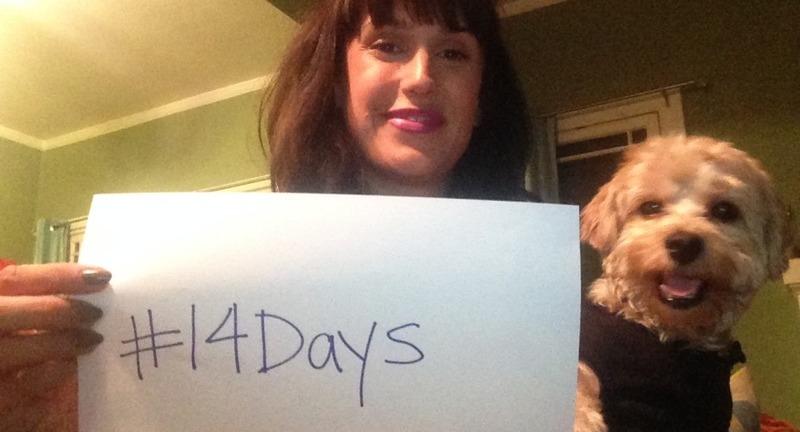 @CBSNew On Sun I will give up alcohol (& sugar) for #14Days or more to help raise awareness for substance abuse. Better late than never! And, if you slipped up, you can always start over. #14Days Wanted the whole 14. Drank last nite but began anew today. Eye-opening. I want this experience. Reread Parvati, Tommy, etc. Helped. Look for Tommy Rosen to return tomorrow to wrap up the #14Days challenge with inspiration and insight about how to keep moving forward.